David Gothard Lions and Tigers and Bears, Oh My! I started my drawing career rendering tedious versions of animals in their environments. A naturalist illustrator is how I envisioned myself. So it's only natural for my mind to be drawn to using animals in a symbolic way, over the years. The animal world has served me well in countless illustrations, but I don't think I've served them well, since subjects such as evil, theft, treachery, and deception are inevitably represented by the cliche and irresponsible perceptions of animals, therefore perpetuating and maligning them as stereotypes. Because our aim is to communicate effectively, we need to work with collective perceptions of the world around us. 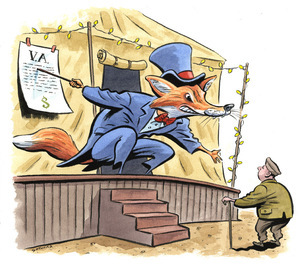 When this assignment landed concerning con men in the insurance industry, luring unsuspecting (aging) vets...the fox seemed appropriate, as a visual solution. So the fox's wonderful ability to survive as an elusive and skillful predator, becomes deception, and is instantly understood as such. It gives an illustrator reason to pause. 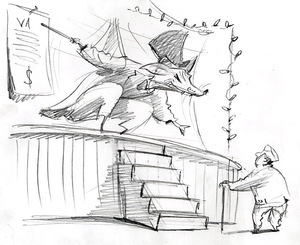 The finished art here will not be seen in print, since they went with another sketch. I took a chance before they responded and went to final art on the sketch I thought was the winner (not!). 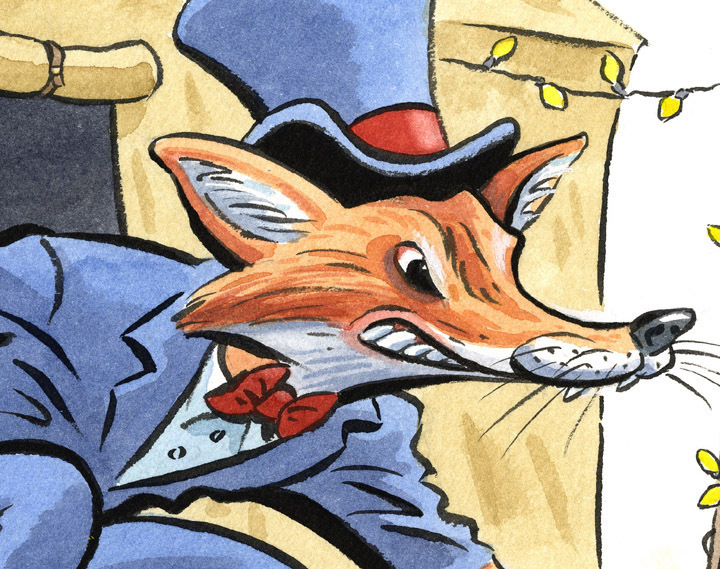 And that's ok with Mr. Fox. The sketch is always more vital. Dave, I'm loving this! Hey, you got a really nice piece out of it. Great to see the close up of the line work. Plus the colors! Very cool illustration, Jeff! I agree with your point about using general perceptions about animals. They can work well symbolically. I can tell from the drawing how much you enjoy doing them. Love the brushwork and color application. Very nice. I've always noted your mastery of animal subjects, David, and feel it is one of the things that make you such a superbly skilled satirist. All those beautiful brushy lines - it's a very nice image. Care to share the other final art (the selected sketch)? Love it, David. Your colors are always perfect.